I cannot get enough of this fun I’m having with the wet-on-wet technique. Have you tried it yet? This week’s tutorial is perfect to practice this skill with a simple shape like an eggplant! I love the different colors you can see in an eggplant – blues, purples, blacks. Try it out by following the instructions below and let the magic of watercolor unfold before your eyes! Step 2. Start sketching the eggplant shape. Think of this shape as an oval with an opening at the top. Sketch your shape with purple or indigo watercolor. Step 3. Fill in the shape. Start filling in the shape with purple and then keep adding some prussian blue or a dark blue to give your shape dimension. The wet surface of the page will allow for some fun blending to occur naturally as you lay your colors. Don’t forget to leave a little white spot on the left to show the highlight on the eggplant. Step 4. Clean off your brush and load it up with green color and sketch the stem. Step 5. 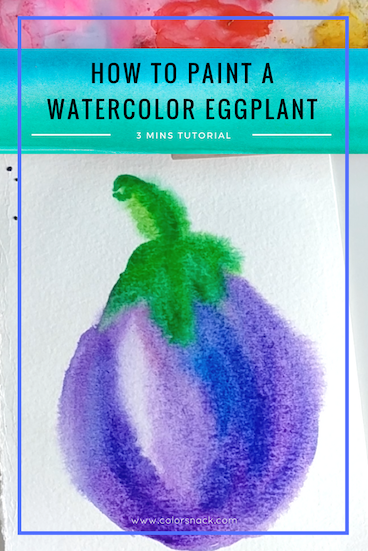 Keep adding more light layers of watercolor to your eggplant, until you’re happy with it. With this wet on wet technique, you can also keep going over the edges to enunciate and deepen them if the colors bled too much.